 every playing card face from a standard deck of cards are on there! 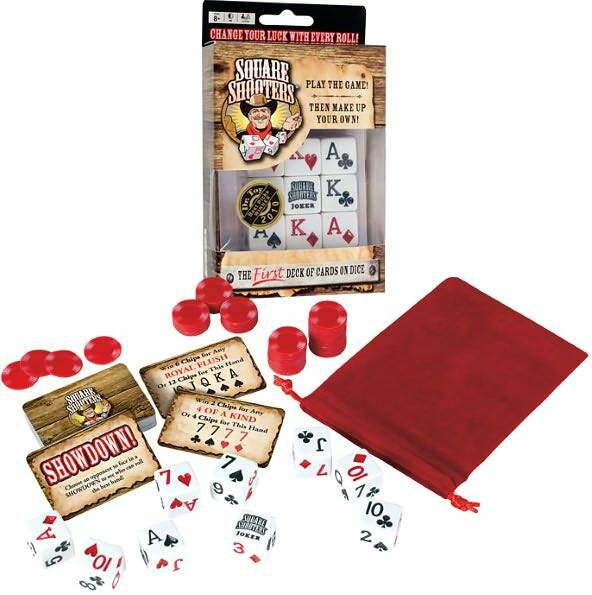 The dice are patented with a special design so you can roll hands for rummy, poker, 21 , black jack and many more games. For example, the dice can achieve every 4-of-a-kind, every rummy run, every straight flush, and every royal flush! using a special target deck of cards included. 9 dice, 42 game cards, score keeping chips, storage pouch, rules. for those days when there's not enough time but you want a bit of fun in your day! ....better poker hands and multiple games variations thanks to these amazing dice!